I bet my Friday was more exciting than yours. In fact, I am willing to put money on it. The morning started out quiet with only one small operation on the schedule (the clinic is open for patients Tue-Thur). 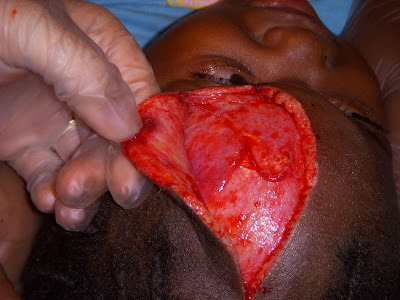 About an hour or so into removing a growth on a little girls' hand, we got word that someone with a bad cut was on the way. Little did we know, there was big drama going down with a neighboring village and we would be at the center of it. Here is the long story short, even though you probably won't believe it. So someone from this village slept with someone from the other village's girlfriend, so a bunch of guys beat him up. Then some of his buddies went back up to the village with machetes to find the people who beat him up. Somehow a totally different guy, who is a pretty bad criminal (just got out of jail where he had been for two years) got his head wacked open with an axe. While he was being brought down the mountain to the clinic to get help, they ran into another bad guy whose lips had been cut off by the axe guy a little while back. So no lips guy gets a machete and is finally going to get his revenge on the already injured axe guy. He takes a huge wack at his neck, barely missing HUGE arteries (obviously intending to do serious harm). They manage to get him down to the clinic but he had lost a lot of blood and was not exactly conscious when made room for him in the dressing room. So Super Lori put the scalpel down on the little girl and started an IV on this guy while we checked out his cuts. Once we got the guy stable and cleaned up, Lori finished the little girl's hand and then spent the next few hours sewing that guy up. Meanwhile, the no lips guy was pacing outside the gate with a machete saying "As soon as he walks out of there I am going to chop his head off". The cut on his neck was awful, and he is incredibly lucky to have survived. The judge came in took some pictures, and got some statements but the crazy thing is that no lips guy can never go back to jail again because someone said it was inhumane to leave him in jail if he could not eat. Crazy stuff. Oh, and while that was all happening a guy we didn't know about came in for his scheduled surgery to have a growth removed from his arm. Good times. Ok so here are the pictures, and I am warning you they are graphic. If you look, and they make you sick, don't get all sassy with me because I warned you. And it's my blog, I can post whatever I want and I live for this stuff! This is after the stitches. If you look closely you can see the very large artery bulging right above the cut. Here are some pictures from yesterday. This little girl pulled a tv on top of her head and was basically scalped from her eyebrow to the top of her head. Lori did a beautiful job on her stitches. Ok I'll leave you with a happy picture. These are the Ivey's kids, Amos and Story. Aren't they precious??? More pictures to come, it just takes me a while to upload them! Love you all!!!! You are right .. you definitely live for this stuff. I love you and am so proud of you! story has some serious SASS in that pic! hey, I am Lori and Licia's little brother. I am way too far away in seattle, and so it does me well to know that have good people like yourself to help them out and encourage them. High fives all around.